AOC Thinks Concentrated Wealth Is Incompatible With Democracy. So Did Our Founders. Hannity was hardly alone in deriding AOC’s antipathy for billionaires as fundamentally un-American. But in reality, there’s nothing foreign or communistic about the idea that concentrated wealth is incompatible with democracy, or all-too compatible with mass poverty. Republicans might call such notions radical. But many of our republic’s founders would have called them common sense. [T]he solitude of my walk led me into a train of reflections on that unequal division of property which occasions the numberless instances of wretchedness which I had observed in this country and is to be observed all over Europe. The property of this country is absolutely concentered in a very few hands…I asked myself what could be the reason that so many should be permitted to beg who are willing to work, in a country where there is a very considerable proportion of uncultivated lands? These lands are kept idle mostly for the aske of game. It should seem then that it must be because of the enormous wealth of the proprietors which places them above attention to the increase of their revenues by permitting these lands to be laboured. If Ocasio-Cortez’s views are un-American, then surely these words from our third president’s are, as well. To be sure, Jefferson’s views on the propriety of wealth redistribution were hardly consistent. And, of course, the slave owner was never concerned with minimizing the number of landless African-Americans or women in the United States. What’s more, the bulk of America’s founders regarded wealth redistribution as a species of majoritarian tyranny, and designed the Constitution to guard against such despotism. 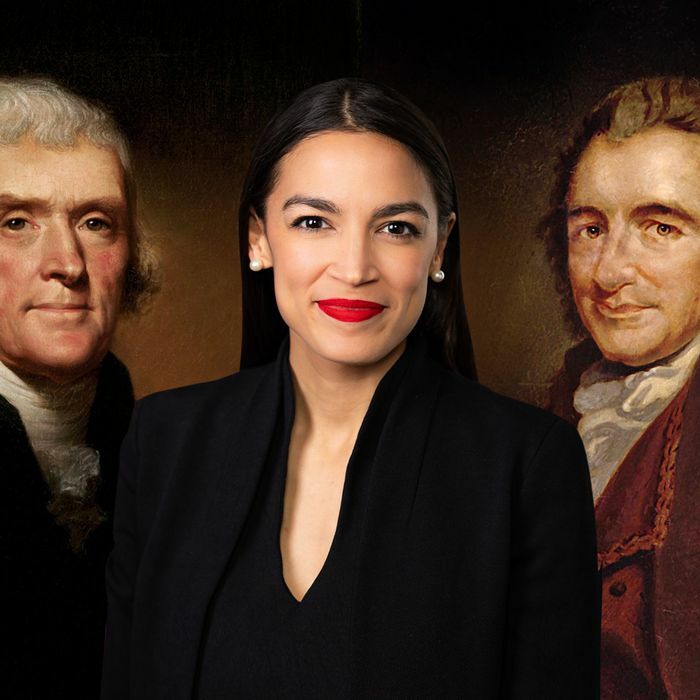 My point here isn’t to suggest that AOC is channeling the sacred wisdom of our republic’s founding racists. Rather, it’s that she’s channeling one deeply rooted strain of American thought on economic morality. And while that strain might have been marginal among the leaders of the American Revolution, it was pervasive among its foot soldiers (there’s a reason the leading propagandist of the war effort, Thomas Paine, was one of the earliest champions of an American welfare state). Regardless, Ocasio-Cortez’s second argument against the existence of billionaires — that concentrated wealth is incompatible with genuine democracy — was something close to conventional wisdom among the founders (including those who opposed democracy). America’s first political theorists took these truths to be self-evident: that a person could not exercise political liberty if he did not possess a modicum of economic autonomy, and that disparities in wealth inevitably produced disparities of political power. Critically, relatively few of the founders saw these premises in a progressive light. To many 18th-century American elites, the fact that the propertyless lacked the capacity to exercise genuine political freedom was not an argument for giving them property, but rather, for denying them the franchise. Similarly, the notion that true democracy couldn’t coexist with wealth inequality struck many leaders of the early republic as an argument against democracy. Thus, Ocasio-Cortez’s belief in the moral necessity of mass democracy (and women’s suffrage, and the abolition of slavery) would have struck many a Founding Father as radical. But her insistence that true democracy is incompatible with America’s present distribution of property — in which the richest 0.1 percent of Americans command as much wealth as the poorest 90 percent — would have struck Jefferson & Co. as tautological. And a large body of political science research suggests that their shared intuition is correct.